This, is a fantastic question. After all, the students aren’t typically involved in the unit planning process (although they should be), however they are all intimately involved with the day to day learning in the classroom. Drawing inspiration from my lovely and brilliant wife, who wrote this fantastic post on her blog Making Good Humans, I have developed a draft of an MYP Learning Experience Planner. Why not lesson planner? Well, I think the word “lesson” implies that the intended learning is over with in one day. It also tends to imply a traditional direct-instruction approach by the teacher (“I’m going to teach you a lesson“). “Learning Experience” carries with it more potential for time, inquiry and excitement. Note that the Statement of Inquiry is a floating header to emphasize its role as the guiding force behind the unit. So, what can I do better? What am I missing? What should I get rid of? I would love to hear your feedback! Students hate dong it. Teachers hate managing it. It isn’t even really that effective. So why do we still assign it? Because we had to do homework when we were in school? Because it’s all part of “doing school“? Because our plans aren’t on schedule and we need to “save time” by assigning the leftovers as homework? At this point in time, I can’t really see a good reason to assign homework. However, there are many (students included) who see value in homework and continue to assign it. One teacher at our school was having some difficulties in managing a system of homework, so she did the most sensible thing any teacher can do when facing a conundrum in the classroom – she consulted her students. Based on the feedback she received from her students (too much work is assigned, we need homework to help us practice, we need a longer amount of time to complete the work…) we devised a homework system that is based, not on work completion or meaningless busy work, but on student choice, feedback and long-term goal setting. Students looked at the feedback from their summative assignments to this point in the year. Based on that feedback, they self-selected an objective and a specific strand within that objective that they would like to improve upon. Students were then provided with an extensive list of homework options (view Google Doc of how this has been set up) that they could choose to work on in order to improve towards their selected goal. Once per eight-day cycle, each student will meet with the teacher and present a piece of work that they are particularly proud of, or would like to get specific feedback on. Following this meeting, the student decides whether they have developed their efficacy within this strand to the point that they need to set new goal, or if they will continue to focus on the original goal. The choice of what to do for homework is in the hands of those that it should be – the students. What happens if a student doesn’t bring any work to the conference for feedback? This is regarded as a missed opportunity for that student to receive feedback and improve – opening up the opportunity for a great relationship building conversation about the value of feedback and creating a learning opportunity for the student. “Are all of our classes going to be doing this? Because they should,” said one student at the end of the class. Student choice? Check. Student autonomy? Check. Potential for effective feedback? Check. Simple to manage? Check. Opportunity for learners of all levels to improve? Check. Valuing learning and skill development over content? Check. By putting the focus on feedback and improvement and allowing for student choice, this homework program was well met by the students. “Are all of our classes going to be doing this? Because they should,” said one student at the conclusion of the class. While I am still skeptical of the benefits of homework, a student centred approach certainly is easier to digest than traditional homework – both as an educator and from the students’ perspective. Do you assign homework? If so, what sort of system do you have in place to ensure it is student centred? Climate change is a big deal. Students in an MYP 1 Science class reviewed the article about Kuwait’s commitment to battling climate change and brainstormed a list of over twenty possible actions they could take to have a more positive impact on the school environment. In fact, what they essentially created was a two year plan for the implementation of a recycling program, campaign against plastic water bottles and eventually the installation of solar panels. Further to this, they broke down what disciplines would be needed to help them in facilitating their goals – not bad for a group of ten year old students on an average school day in late November. Their Science teacher, sensing something awesome was in the works, contacted me with the plan that her students generated, excited to bring this to the rest of the MYP 1 team. Now, the MYP 1 team was currently in the throes of developing a pretty awesome interdisciplinary unit, but when student voice is your priority, you can’t be shy about pressing the pause button on your “teacher business”. One of my favourite sayings is that students should be working on the same type of problems adults are working on and this fits that criteria perfectly! I went to the class that generated the list, and we held a quick and impromptu election of student representatives who would be willing to speak on behalf of the entire MYP 1 year at an upcoming interdisciplinary unit planning meeting. While these students were excused from class in order to attend the meeting, I would argue that the skills and IB Learner Profile traits they are developing by representing their peers at the planning table is a unique opportunity that cannot be passed up. At this point, the student looked at the group of nine teachers around the table and said, “What do you guys think?” – now that’s collaboration! Who better to plan the unit than the learners themselves? Our teachers were fantastic, involving the students in every facet of the conversation and really honouring their opinions. “How can Individuals and Societies help you learn more about this issue?”, one of our teachers asked. “Do you think you would be interested in…”, was a sentence-starter used by many of our teachers. Not once were the students talked down to, not once was a teacher afraid to disagree with a student and not once did the students feel intimated to share their opinion – even if that opinion was contrary to their teachers. How empowering must that feel to the learner? How inspiring must that be for the teacher? Another benefit – the teacher engagement was off the chart. There was no idle chit-chat, no dwelling on classroom management issues, no getting distracted with lesson planning or grading, no talk of being busy or overwhelmed. When we invite the students to the planning table, we are reminded of why we do what we do. This is how we can make our work more significant, relevant and engaging. Student and teacher engagement was off the charts. I encourage and challenge you to plan your next unit in conjunction with your students. I have challenged our staff to do the same and will be sure to document their experiences in this space. Do you have experience planning units with your students? How did go? Last time we talked about the importance of tuning-in to the Key Concept and looked at the importance for all learners – students, teachers, administrators, coordinators, councillors, parents – to tune-in to the Key Concepts. Today, we will take a look at how to keep the Key Concept alive throughout the unit by planning with the concept in mind. Once teachers have tuned-in to their Subject’s Key Concepts, they need to opportunity to find out more about the Concept. For this, our teachers went straight to the source. 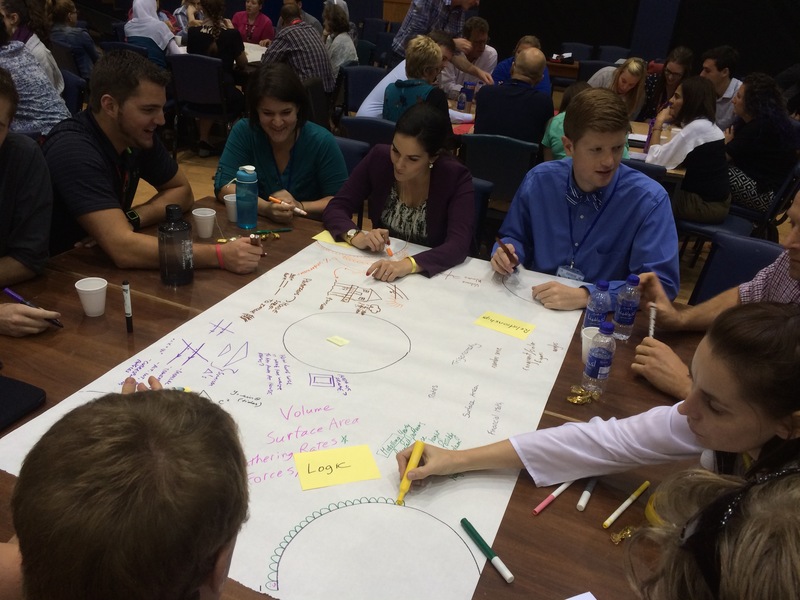 Using MYP: From Principles into Practice our teachers were able to find out IB’s definition of their Key Concepts. This process however, is not as valuable without the step of sorting out this information. Once they had found out the definition of each of their subject’s Key Concepts, our teachers extracted some of the key words from the definition. 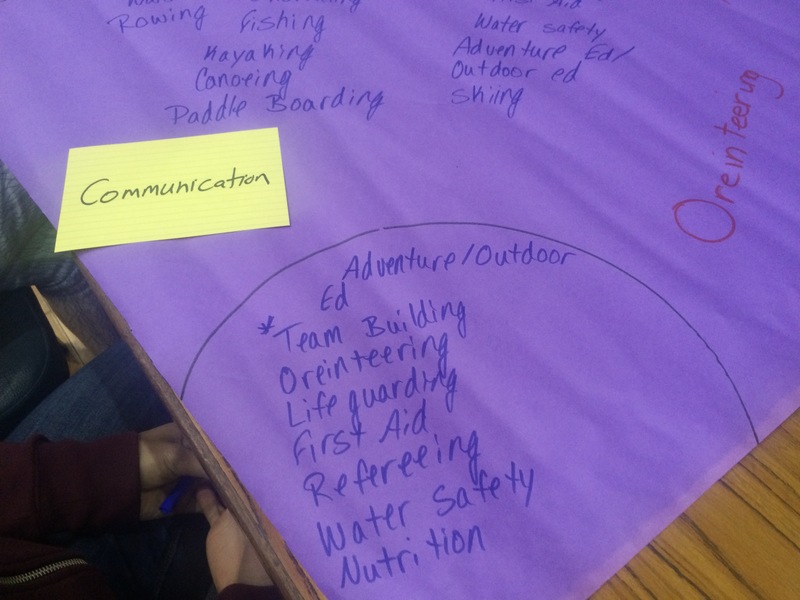 Looking at these key words, they jotted down some ways in which that key piece of their concept could be brought to life via the content of their classrooms. This finding out/sorting out phase has provided our teachers with the beginning of planning tool that they can use continually connect their curricular content to their Key Concept and, hopefully, keep the concept alive throughout the course of their units. It is important not to lose sight of the concept when you are devising a summative assessment. For example, a math unit using the Key Concept of Relationships whose summative assessment is a multiple choice test about factoring binomials, will have a hard time in keeping the concept alive. In order for the students to get the most out of their journey with concepts, they need the opportunity to apply their newly refined conceptual understanding in a meaningful way. In my opinion, the best concept-driven assessments make explicit reference to the concepts itself. A good place to start is by using the following framework – “How does your understanding of [insert content area here] contribute to your understanding of [insert Key Concept here]”. How students demonstrate this understanding is up to you…or, to create a more meaningful experience, leave that up to the student. Explicitly connecting the concept to the summative assessment will help you avoid the concept getting lost during the course of the unit. Next step? Taking a look at how exactly one of our teachers is keeping the concept alive throughout a unit. As an MYP school, our teachers are committed to a conceptual framework for teaching and learning within their classrooms. They know that students are able to make sense of content and how that content relates to the world with greater efficacy when the learning takes place through the lens of a concept. They also face the challenge of balancing conceptual education with the content from their subject group. During this balancing act, sometimes the concepts can get lost in favour of the content. One of the biggest questions I get asked is, “How do we keep the concept alive throughout our units?”. In this series, we will look at some strategies of how you can keep your subject’s Key Concept alive throughout your units. Departments working together to tune-in to Key Concepts. This tuning-in process begins before the students even engage with the unit, as it is equally important that teachers, administrators and coordinators tune themselves in to the Key Concepts. Our teachers are currently engaged in a Curriculum Connections pilot facilitated by the IB. Throughout this program, we will be exploring how to connect our curriculum documents with the MYP frameworks. At our last Professional Development meeting, our MYP teachers tuned-in to Key Concepts by unpacking the ways in which the concepts can manifest themselves in their subjects. They looked at the Key Concepts they are responsible for teaching and broke down all of the potential topics they could use to teach through that conceptual lens. The best connections were when our teachers recognized that their content was applicable to many concepts, but that the choice of concept would drastically change how that content would be inquired into. Tuning-in to the concept and the content. The second step was for the entire staff to tour the room and see how other teachers might approach the same or similar Key Concepts through the lens of the different disciplines. This really got the interdisciplinary wheels turning in many teachers’ minds as they could see the possibilities that exist when you focus on concepts! When tuning in to an idea as huge as a Key Concept, it is important that the leaner is given the opportunity to reflect. This can be as simple as asking the question, “What do we still need to learn?” or “Where do we go from here?”. 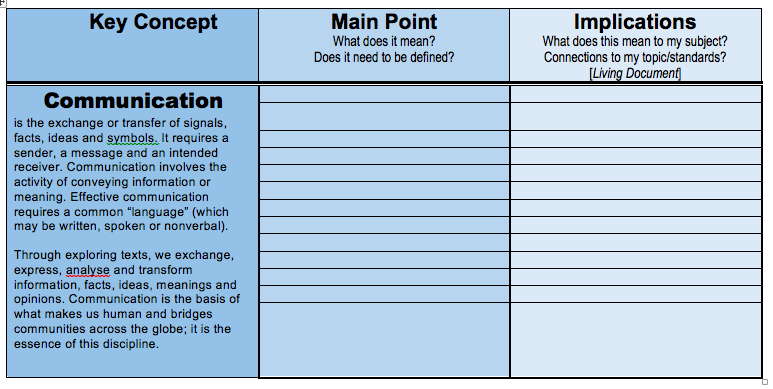 This step gives value to the tuning-in process, as learners can see that this step will guide the rest of their inquiry into the Key Concept. By engaging in this tuning-in process, our teachers not only developed a more robust understanding of how their curricular content and Key Concepts go hand-in-hand, they also developed a richer appreciation for how the Key Concepts manifest themselves in other subject areas. Finally, they had the opportunity to formulate a meaningful plan for next steps, guided by the questions that arose from this tuning-in activity. As we often encourage our teachers to do, their efforts of tuning-in to the Key Concepts should be echoed by their students. While it will probably only be one concept at a time that the students focus on, this opportunity to take stock of and ask questions about the big idea that will drive the unit is a crucial step in ensuring effective conceptual understanding. Where do we go from here? Keeping the concept alive by planning with the concept in mind. How does your school tune-in to Key Concepts? Are we prioritizing the tradition of a report card over student learning? This week, a scary thing happened. Many of the teachers at our school are looking at our assessment calendar and noticing that we are in a definite time crunch before teachers will need to submit their grades for the first trimester reports. Traditionally, our teachers have been asked to submit a grade for each student in all four of their subject’s MYP objectives by this reporting date. Needless to say, with a truncated schedule due to holidays and valuable time spent building relationships at the beginning of the year (more on this later), many teachers are feeling short on time. “We’ll just give them a quick test to get a grade”. “This project sounds good, but let’s be honest, we just need to get a grade”. “The kids aren’t ready, but we need to get those grades in”. These are a few of the things I have heard during collaborative planning sessions this week. Teachers are doing their very best to accommodate our reporting schedule, but perhaps unfairly or inauthentically assessing their students in the name of “getting a grade”. “I know we are encouraged to get to know our students at the beginning of the year and build relationships, and philosophically I support that…but practically, it seems like a waste of time. I wish I had gotten right down to preparing students for assessments instead of getting to know them, because soon I’m going to need to get my grades in”. This is not a verbatim quote, but it certainly captures many discussions I have had recently. Building relationships with our students a waste of time? Yikes. I know that none of our teachers believe this. I know they are saying this in light of reporting deadlines that are demanding and have them rightfully stressed out, but it’s still concerning. In the 21st century, is there a need for any school to still offer a traditional report card? Most schools have a live, online reporting system for student assessment, and even if a school doesn’t, it is quite simple for a teacher to leverage a shared Google Doc that can be updated with feedback, grades and all sorts of quality information to parents, as it happens. We often talk about relevant and timely learning, what about relevant and timely reporting of learning? As a parent, when am I more interested to see feedback on my child’s learning – as the assessment is happening, or at a predetermined “report card” date that may be months down the road? Even further, do I want my child engaging in assessments that have been designed solely with “getting a grade” in mind? Don’t get me wrong, I am not advocating for all traditional reporting practices to be revamped. On the contrary, I think student-led conferences with parents and teachers are amongst the most wonderful conversations that we, as educators, can have with the families of the children we teach. My concern rests with the seemingly dichotomous relationship between traditional “report card” structures and assessment that is learner-focused. Let’s not put our students in a position where “getting a grade” becomes the driving force behind how they share their learning – not only is it inauthentic, it does not honour the natural process of learning, which often does not fit with a predetermined schedule. How does your school handle reporting grades? Your class set up: to give students a voice, to help promote collaboration, or to elicit compliance? This year during our staff orientation week, one of our colleagues presented on the dynamics of classroom set-up. He had just completed Masters work in how classroom design can impact student learning and with inspiration from the Reggio Emilia approach, design thinkers and Starbucks, he shared a lot of great reserach to help our teachers prepare their physical spaces for the for the beginning of the year. When it comes to classroom set-up, it seems that there are three models often at play: eliciting compliance, promoting collaboration and honouring student voice. Since walking into your classroom is one of the first impressions students get about you, let’s take a look at these three models to see what the physical space of our classrooms might be saying to our students and what it might be saying about us as teachers. This set up not only says to students, “I am in charge”, but it also says, “I own the learning”. 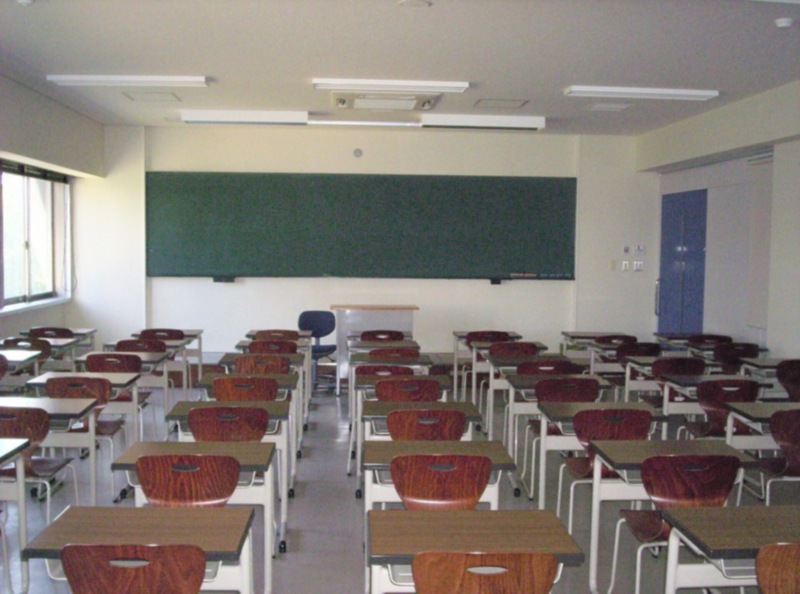 By placing students in rows, all facing one location, we communicate that the teacher is the primary source of knowledge and that the majority of student learning will occur while they are looking at the teacher holding court at the front of the classroom. This also says to the students that they will be typically working on their own, on whatever business the board or teacher at the front of the room dictates. The assignment of seats tells students that the teacher owns their decision-making over where they work best and communicates to the student that they are in a particular seat for a reason. This popular set-up says to students, “You will need to work together!”. It also communicates that a majority of the learning will occur with one’s peers, rather than with one’s teacher. Students know when they walk into a classroom with groups that the class is probably going to be rooted in inquiry and discussion. This set-up tells students that they will be engaging in learning experiences, rather than lessons. Assigned seats typically communicates a strategic variance in groups based on skill level, while student choice of seats promotes autonomy and the idea of figuring out whom you best work with. This set-up, although rarely used, communicates to students “you know how you learn best and your voice matters”. 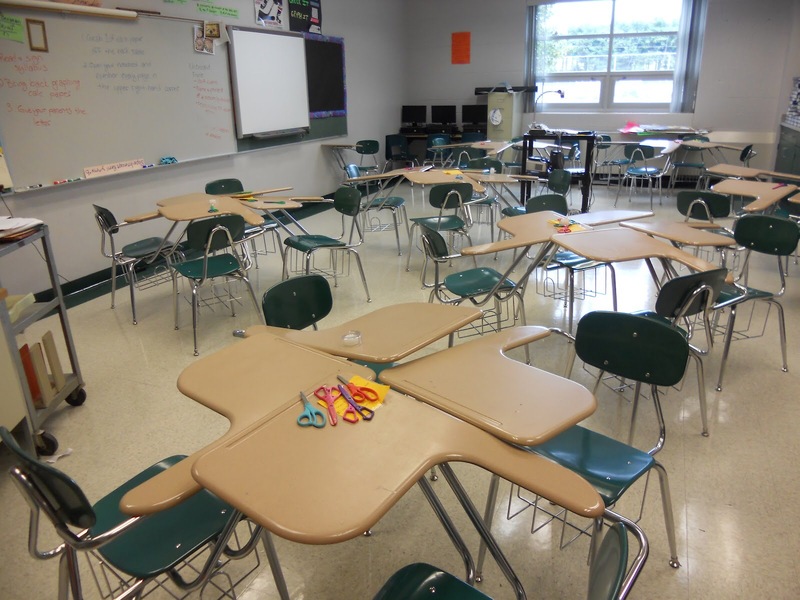 In this type of set-up, teachers will hand the reigns of classroom design over to their students and allow them, through a process like the MYP Desgin Cycle, to figure out how to set up the classroom in order to meet their learning needs. What this often looks like is flexible seating – areas for group, partner and individual work; workstations on the floor, workstations made up from comfortable furniture like exercise balls, beanbag chairs and stools. 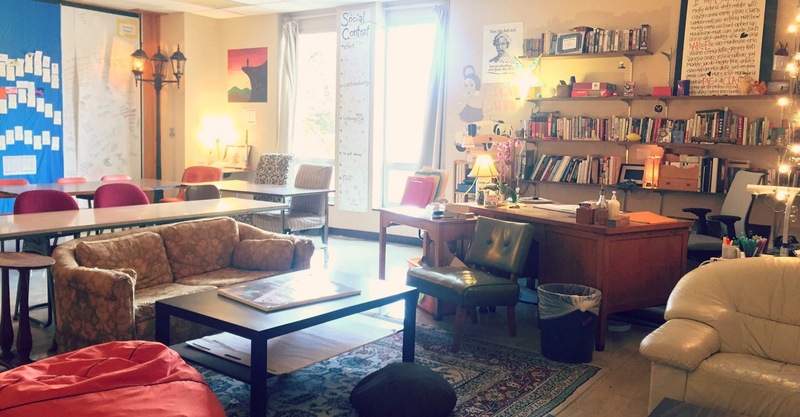 This type of set-up can accommodate both introverts and extroverts, allows for student-friendly social groupings (not social groupings dictated by the teacher) and generally creates a comfortable, yet dynamic learning environment. By allowing students to chose where and how they work, the teacher is showing that they respect the voice of the students in their classroom and that the students are valued as important decision-makers in the learning process. Of course, seating arrangement is just one piece of the puzzle when it comes to how we engage with our students. Nonetheless it is work examining the message that a teacher can send to his or her students via the choices they make (or don’t make) regarding the classroom space. What is your experience with these models of classroom set-up?